Read here how to post costs and working hours in InLoox PM Web App. The system assigns the effort to the project plan automatically and stores a separate cost record. In the project, on the Start tab, in the Sections group, click Time Tracking. On the Time Tracking page, in the Edit group, click New. In the Date and Duration area select the Start date time and Duration. In the Allocation area select the Group or Activity / Milestone option from the planning, to which this entry belongs. InLoox PM Web App provides you with different formatting features for the Description field text. For more information about these features see Create and change comments, in the Customize a comment section. In the Details area choose from the Flag drop-down list a colour to mark the item in the time tracking overview. Select the Is billable control box to bill this entry on the Budget page. The entries with this status are included in the actual revenues of the project budget. In the Performed by box choose a name of the person, who carried out the item. Click Performed by and choose a name from the Select contact dialog box. InLoox PM Web App saves automatically the name of the person, who created the item or last edited it. On this tab, click New to add a new document. Click Link, if you want to add an existing document from the Document page. Click Document to add a new one. 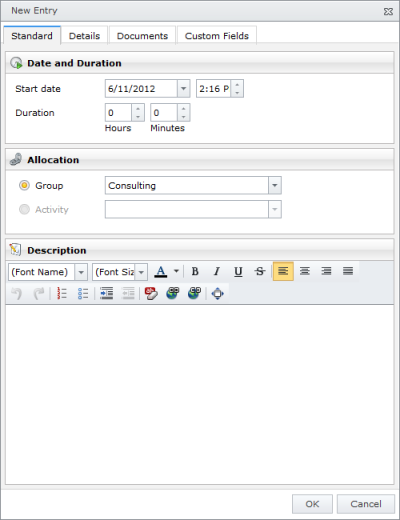 Now, you can see the added document on the time tracking list marked with a symbol . Click this symbol to open the document. This document is also saved on the Documents page. Inform via email the project team members about e.g. project status. Click the Details tab and then email icon right to the Performed by field. For more information see Select project team members, in a Send an email message section. Create and edit a time tracking entry - InLoox • Copyright 1999-2019 © InLoox GmbH. Tutti i diritti riservati.